TPSF Executive Director Pamela Johnson-Betts, Scott teacher Pat Nash, Scott Asst. Principal Sarah Lucero and TPSF President Bonnie Robles pose with Scott P.E. students. 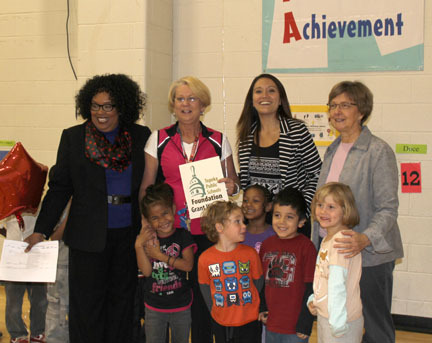 The Topeka Public Schools Foundation (TPSF) Grant Patrol visited several District classrooms on October 19 to inform teachers they have been awarded funds for projects in their school or classroom. The TPSF grant allocations committee recently reviewed grants submitted by educators from Topeka Public Schools. Twenty grants were approved for funding, totaling $27,490. Grants are for classroom/school/district-wide innovative projects and provide opportunities for students that may not otherwise be possible. Foundation executive director Pamela Johnson-Betts said the Foundation annually distributes educational grant dollars to Topeka Public Schools because "grant dollars provide needed support to the district, endorse educator's creativeness and benefit students with expanded educational opportunities."